When I was young boy growing up in India, I remember eagerly waiting for the mango season (May to July). There was no greater pleasure in the heat of the summer than to have juicy mangoes after our regular meals. In a way that was the only time I suppose we regularly had something sweet after a meal. But I also remember developing a taste for raw green mangoes. I remember going into neighbour’s garden and throwing stones at the mangoes to get them off the branches and having them just sliced and sprinkled with rock salt. There was this strange sour tangy and crunchy feeling that made this stand out. My grandmother also made a slightly runny chutney in the summer months that I remember. Then since I have come to UK, I had almost forgotten about green mangoes. But in the recent years there has been a steady supply of this little green beauties now available widely. Since we moved to Jersey, CI we have come across a veg supplier (Just Williams) in the Central Market who sources and supplies a lot of Indian, Bangladeshi, Thai and Caribbean products. On one of my recent visits I spotted raw green mangoes and bought a few. With the fist ones I made a red lentil dhal with green mangoes. Then I decided to do something different to the second batch I bought. 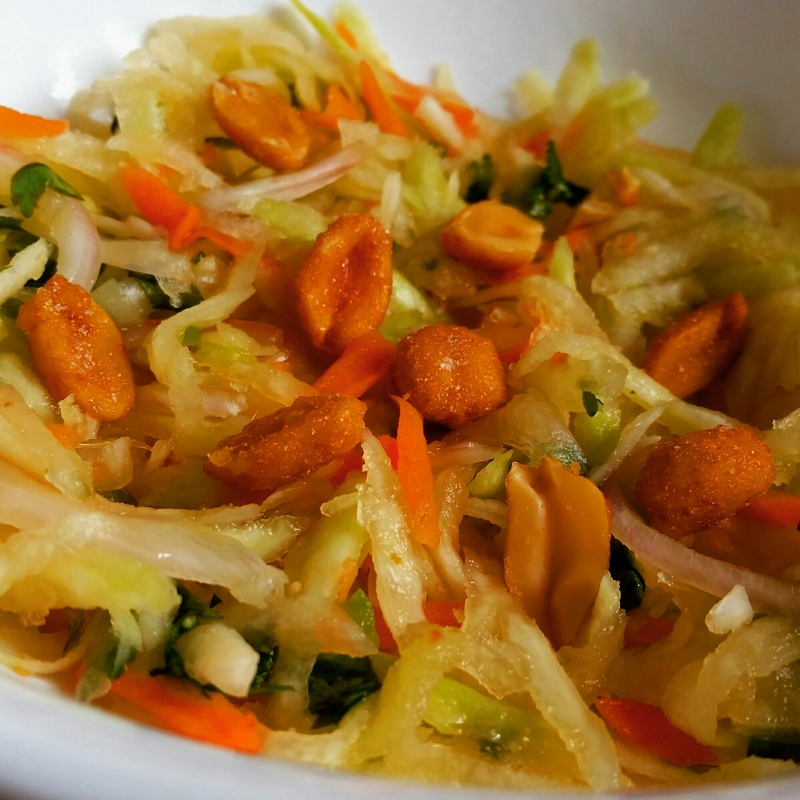 I came across various recipes on the web for Green Mango Salad (similar to the more popular Green Papaya Salad). The dressings varied from the Thai to the Vietnamese etc, some had shrimp paste in it, some had birds eye chilli, some required pounding and some added garlic. This is my version keeping it as simple as possible. Grate the mango and the carrot (make sure that you discard the seed in the middle of the mango). Diagonally slice the Spring onion or thinly slice the shallot. Add the shallot or the spring onion with the green mango and carrot mix. Mix the Lime juice, Fish Sauce, and the Rice wine vinegar. Mix well with the vegetables. Slice the chilli finely (discard the seeds if you don’t want too much heat). Finely chop the coriander. Mix it well with the dressed vegetables. Fry the peanuts and scatter over the salad. Serve immediately. This is great on its own or with some Prawns fried in Garlic scattered on top. 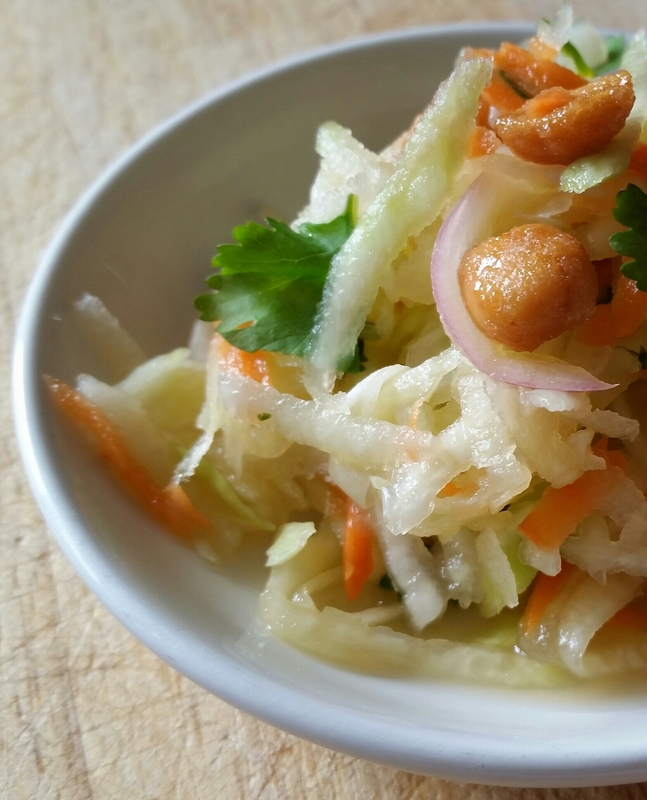 It is also a great accompaniment to BBQ or grilled Meat, Chicken or Fish. You can also add basil and / or mint instead of or on top of the coriander and alter some of the other ingredients. 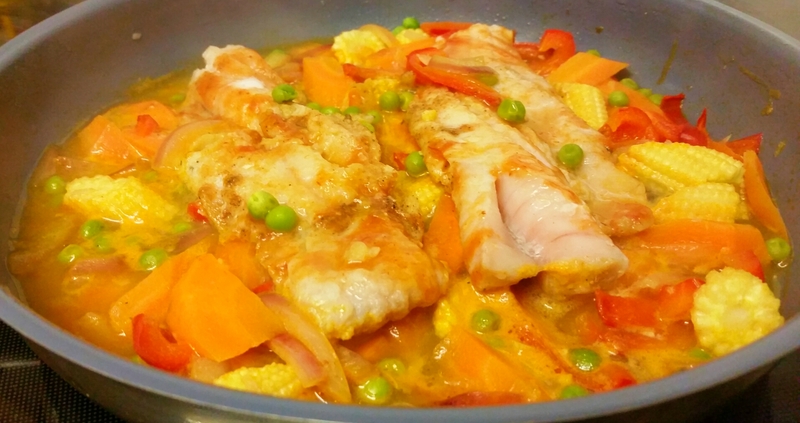 The fish sauce can be substituted with Soy Sauce too to make this dish completely vegetarian. 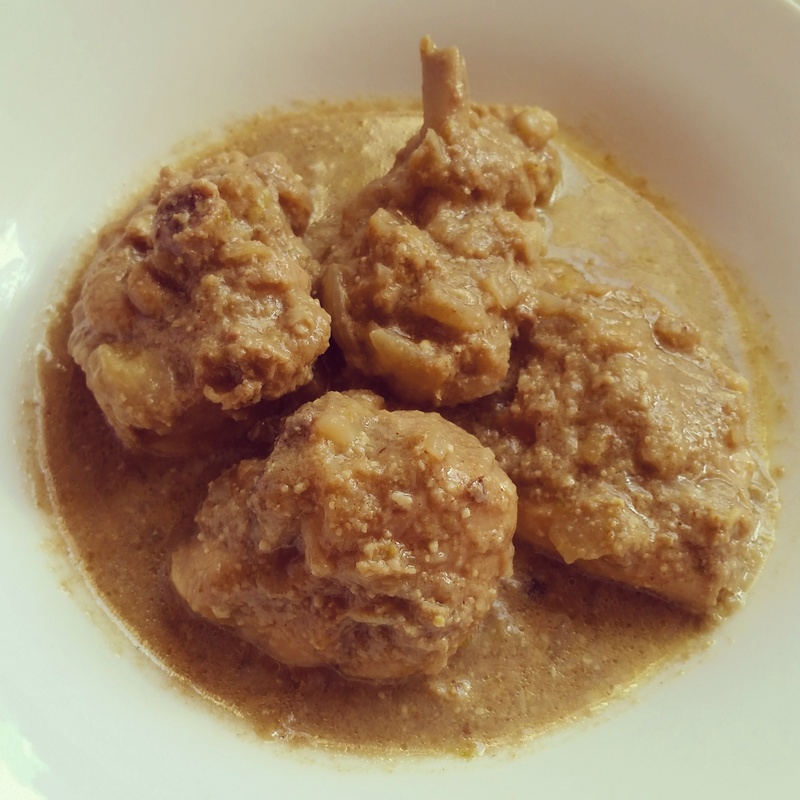 Korma or Quorma a dish influenced by the Persians and been perfected in the kitchens of the Mughal Emperors. It generally points to a dish of Meat, Game, Poultry or even Vegetables braised slowly with yoghurt or cream (or both) and a paste of nuts. The gravy is usually paler and subtly spiced compared to a lot of the other tomato based gravy that are so common in Indian cuisine. But unlike the way its marketed in the west it is not necessarily a mild (in some cases sweet tasting) dish. In spite of the long (ish) list of ingredients, please do not be put off to give this a go as its fairly simple to prepare. I like using Chicken on the bone for more flavour and in this case it also holds on to its shape better to stand the slightly longer cooking process. At a compromise use thigh fillets. I also use shallots for its milder and sweeter taste but white onion is perfectly fine to use. The Black Cardamom is optional. It does add a certain smoky flavour to the dish that I personally like but if you do not have it or don’t want to buy it for one particular dish then that’s perfectly fine. The Poppy Seeds and the pumpkin seeds are essential. try and get the white poppy seeds. Use unsalted and unroasted cashew nuts. If using the salted one soak in warm water and drain before making the paste. Mix the Yoghurt with 3 tsp of ginger and garlic paste. If necessary wash and dry the chicken. put some salt and rub. Then apply the yoghurt mixture and mix well covering all areas. Leave for about 4/5 hours (at least allow for an hour but longer the better). Make a paste with the cashew nuts, coconut, green chillies, melon seeds or pumpkin seeds, poppy seeds and a bit of water to make a medium consistency paste. Slice onions. Heat the Ghee or oil in a heavy bottomed pan over a medium heat. When hot add the sliced onions. Fry till translucent but do not burn them. Add the remaining ginger and garlic paste and all of the whole spices and the bay leaf and stir for about 2 minutes. Now add the marinated chicken and the remaining marinate. stir this for about 10 minutes till all the mixture is well mixed. Add the cumin, and coriander powder. Now add the paste that you made earlier. Mix well. Add a tiny bit of water. Cover with a light lid and cook on a low to medium heat till the chicken is done. Check form time to time to make sure that the meat is not sticking to the bottom of the pan, adding a tiny bit of water if necessary to prevent that from happening. Check Seasoning and add a bit more salt if required. Just before taking it of the heat, sprinkle the garam masala (if using). Stir and Serve. Chutneys are an integral part of Bengali food culture. Traditionally they are made to be of slightly thin consistency compared with the chutneys in the west and are usually consumed on the same day unlike the west where we tend to store them for longer. 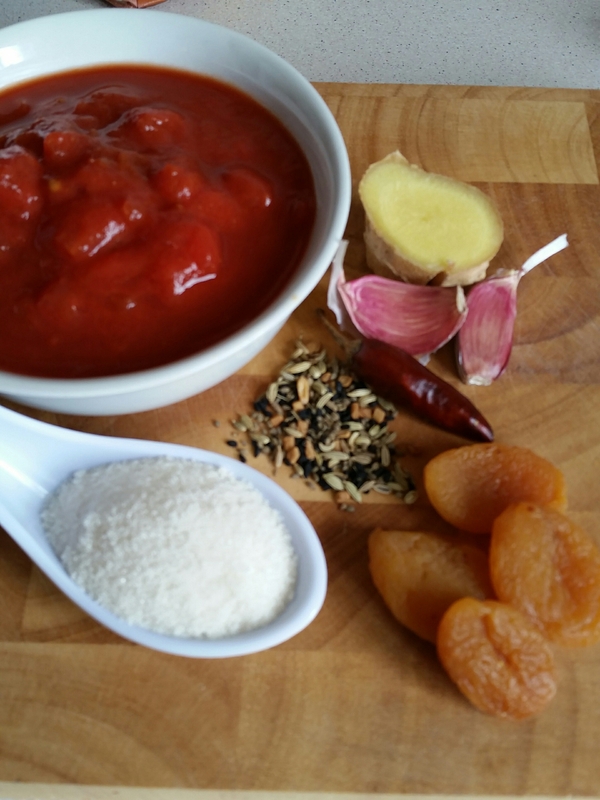 In summer months a sweet tangy chutney would be prepared usually of raw mango, or tamarind, or pineapple etc and served at the end of lunch meal. Its said to aid digestion and also help in cooling the body. During a multi course feast the chutney would come after the main course and before desserts to act as a sort of palate cleanser similar to what some sorbets supposed to do. In Bengal Chutneys are popularly made from raw mango, tamarind, pineapple, tomato et. They also add dried dates and Aamsotto (mango fruit leather). 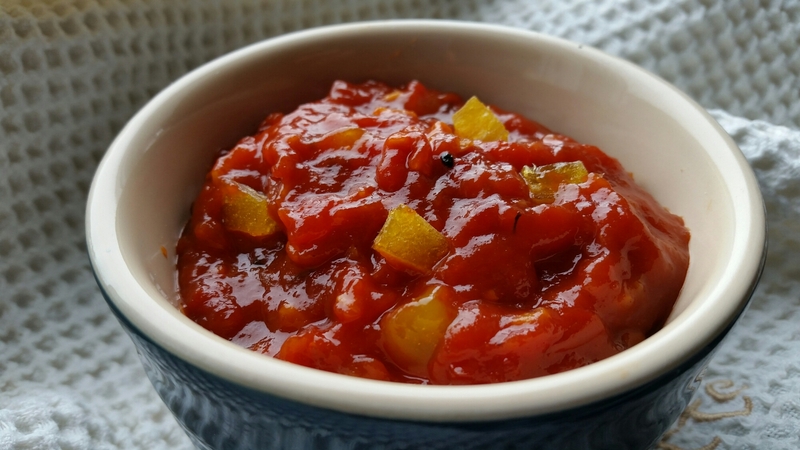 This tomato chutney takes me back to my childhood days when my grandmother used to make it. I have made it slightly drier so that it will stay in the fridge for about 5 days if necessary. It’s an easy and quick recipe but the Panch Phoran (bengali five spice mix consisting of Black mustard seeds, cumin seeds, fennel seeds, fenugreek, kalonji seeds) is a must (you can make your own but it’s far easier to buy ready mixed and then you need only one. It is available in good Asian markets and in an increasing amount of our regular supermarkets too (Waitrose sells them). This is great on its own but you could add some dried fruits to it like apricots, dates or if you can get your hands into it, another Bengali delicacy the aamsotto (fruit leather made from mango) also known as a am papad in other parts of India. Optional extra 2 tbsp chopped mango fruit leather or 5/6 apricots or dates chopped. Heat oil in a heavy bottomed pan. Add the spice mixture. As soon as they start to pop, add the ginger and garlic and the chilli. Stir for about 2 to 3 minutes. Add the tomato. Add the pinch of salt and the sugar. Cook on a medium to low heat for about 20 minutes stirring often. We are looking for a stage where the mixture sort of sticks together and it’s not runny. Now add the dry fruit if using and stir for another 5 to 10 mins. Take off from the cooker and let it cool down completely. Store in a clean jar or a container in the fridge and use as required. Do not forget to lick the spatula and the spoon. 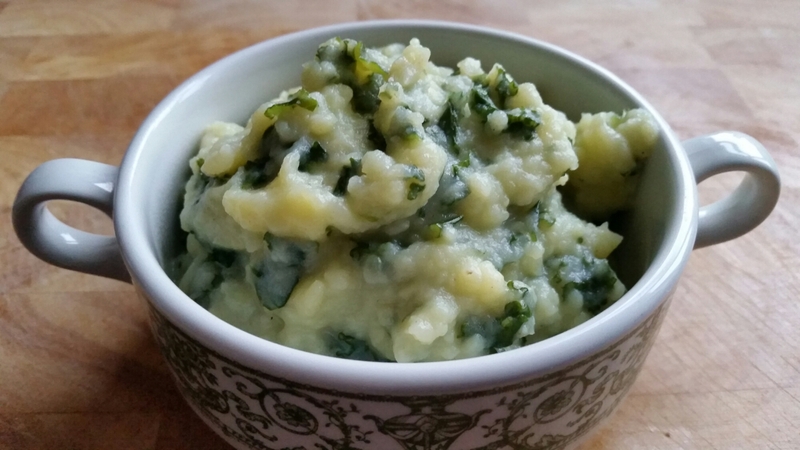 This is a popular Irish dish of Mash Potato mixed with Cabbage or Kale and forms a nutritional side dish to steak or fish or even Irish Stew. For best results peel the potatoes and cut into big chunks. Wash and soak in cold water for as long as time will allow. When cooking change this water and boil in fresh water. Add the potoes in fresh cold water and bring to a boil. Boil till done. Blanch the Kale or Cabbage in salted boiling water and drain. Drain the potatoes and mash. Add the cabbage, butter, cream (if using) and seasoning and mix well. Keep warm and serve when required. I have often acknowledged my love for roasted Red peppers. I love the smell and the taste of it and often make it at home when I have some spare ones and am using the oven for cooking something else. 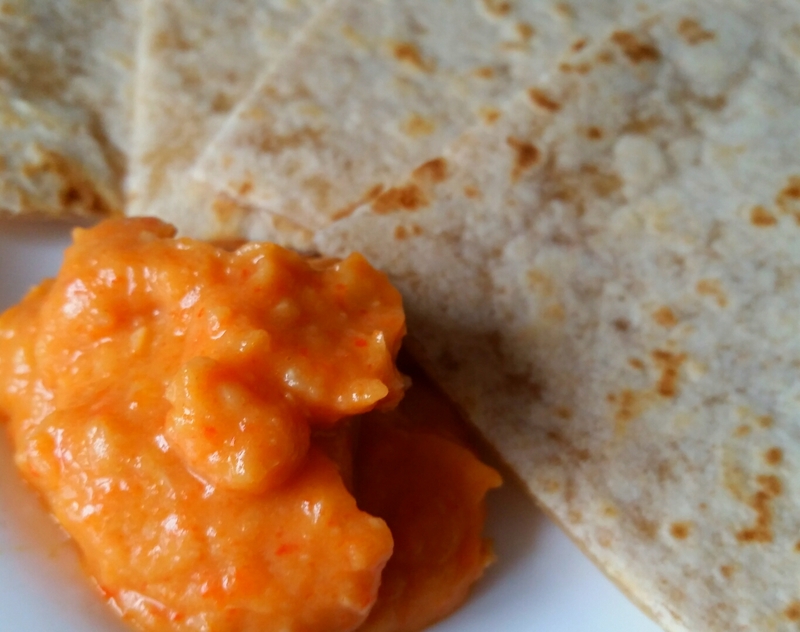 It’s great as a pepperonata Dip or Sauce (recipe here) and its also a great addition to Hummus. Hummus are very easy to make and are very healthy too. Do not be afraid to experiment with different flavours and trust me the end product will be way better than the supermarket versions that we buy. The following recipe uses Butter beans instead of the traditional chickpeas. The Butter beans produces a creamier end product and so we do not use much oil and do not add any Tahini (sesame seed paste) and thus making it even healthier. Reserve some of the juices that ends up on the roasting pan. Roast the peppers and leave them covered to cool and this helps to peel the skin off easily. make sure that the peppers have cooled down completely before using them. I often roast them after cooking some dinner in the oven and then leave them on the kitchen top covered to cool overnight. This way I also can get fresh Hummus prepared in no time in the morning. Drain the beans and take the skin off (optional) if you like a creamer end product. I take about a half off and leave the other half. Then put all the ingredients except oil in a food processor and process for a minute. If you want to have a less thick end product add some of the juices from the roasting tray. Now with the motor running add the oil slowly. Mix well. Season and serve with nice toasted bread, or vegetable sticks or pitta bread crisps or whatever takes your fancy. Kerala is a tiny state on the South Western end of India but when it comes to food it packs a big punch. It’s been on the Spice Map since about 3000 BC and is primarily known for growing top quality Peppercorns, Cloves, Cinnamon, Cardamoms among others. The spice trade bought in the traders from all over the world from the Greeks, Romans, Arabs (including the Syrians who were the first Christians in India), Chinese, Portuguese, Dutch to the British. (Vasco Da Gama landed here in 1498 which opened the door for the rest of the Europeans into India) and they all left some mark in some form or the other in the local architecture, cuisine, and culture. With the coastline and the freshwater lakes , Kerala is also a big producer of Fish and Shellfish. There is a abundance of Coconut trees too. No wonder that most of these lovely produce make it to their local cuisine. The state also has a sizeable Muslim and Christian population and their influence on the local food cannot be ignored. 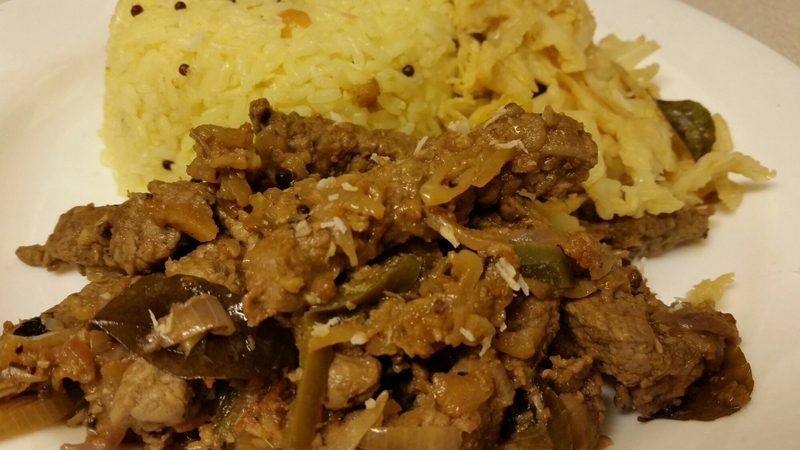 One dish that we will be taking about today is the Kerala Style Beef Fry. I first had this dish in a small Restaurant in the Keralan Hill Station of Munnar in 2004 when we stopped there for two nights on our honeymoon tour around Kerala. I was taken back by the simplicity but a lasting taste of this dish. Sneha, A Mumbai based restaurant last week won an Chowzster Asia award for this Beef Dish (but you will not be able to eat it there as the sale and supply of Beef is since been banned in the whole state of Maharastra of which Mumbai is the Capital). There are many variations of this dish and its mostly served as a snack accompanied by some flaky Malabar Parathas but can be served as a main course with Rice or Dosa or Appams. I have tried to simplify the dish as much as possible using ingredients available in the UK. The Cinnamon, Cloves and Cardamom can be substituted with 2tsp of Garam Masala but the taste will vary considerably. I also use Star Anise sometimes. If you have any in your kitchen Use one or two but reduce the Cinnamon, Clove and Cardamom. The following should provide 3 medium portions or 2 large portions. I have also used sliced fresh fennel. If you do that then use half a bulb of fennel and reduce the onion by half and do not use the fennel seeds. Rump Steak – 500 gms (ask Butcher to tenderise the meat ie beat it thin with a meat hammer or do it yourself at home). Cut it into medium thin strips. Dry Roast the Fennel, Cardamom, Cinnamon, Cloves, Peppercorn, Red Chilli, Star Anise (if using). Cool and Powder using a spice or coffee grinder or in a pestle and mortar. 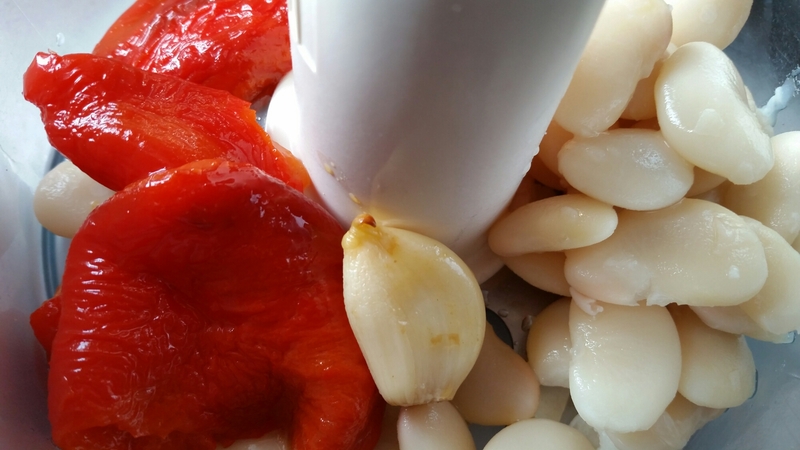 Marinate the meat with Salt, The spice mixture, ginger and Garlic paste and the tomato purée. Rub well and set aside for about 2 to 3 hours. Heat Oil in a wok. Add the Mustard seeds and as soon as it stars to pop, add the sliced shallots or onions, fry for about 5 minutes on a medium high flame and add the curry leaves and green chillies. Fry for another 5 minutes. Now tip the marinated meat mixture and stir on a flame for about 10 minutes. Add a drop of water if necessary and cover and cook till done. Uncover and stir. Check seasoning and serve garnished with dessicated coconut. This dish is best served straight away with Paratha Breads or Rice. In the following picture I served it with Lemon Rice and Cabbage Thoran (recipes to follow). For a quick midweek dinner using store cupboard items this dish is fairly easy to put together and very satisfying too. I have used Tinned Plum Tomato but you could use tinned Chopped Tomato too. 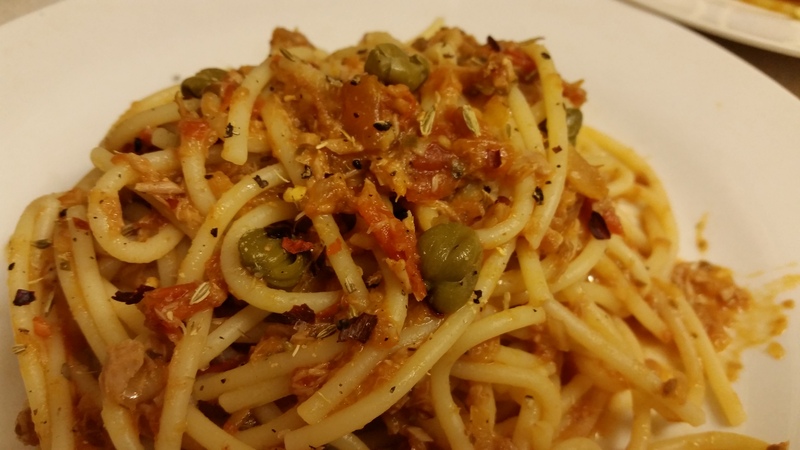 I have also added capers to this dish as I had some lying in my fridge but if you don’t have it then do not worry. I have used Spaghetti here but you could make it with with whatever pasta you have lying around. I would have loved to have been able to finish this dish with a good sprinkling of Parsley but on this occasion I had none left. So if you do have some add them just before serving. You could also add chopped olives if you prefer and have some lying around. (ps. the sprinkling that you see in this picture is a shop bought Chilli Garlic Mix that also includes fennel. Its quite nice and I add this to a lot of my food). After a few weeks of eating to our hearts content during our trip to India, it was time for some simplicity and some home comforts. The morning after we arrived back a supermarket shopping trip was the first thing on the list. Out sleeping pattern seemed to cope with the timing better than out tummy. (India being five and a half hours ahead). We fell asleep early around 9 pm and woke up around 6.15 am feeling fairly refreshed but very hungry. Soon after the school run A bowl of Porridge followed by a yoghurt and then a few pieces of chocolate were consumed before we headed to the supermarket. During shopping we felt another hunger attack. At that point we decided to get back home and make a quick soup. My wife spotted a 450 gms mixed diced casserole veg pack with kale and pearl barley. So we came home and she started to prepare a quick tasty soup. I added the Thai Green twist but kept it simple. I have tried to break it down as best as possible to get a recipe. You can use any vegetable mixture as per your choice either from fresh or a pre packed one. Our 450 gms pack (including the Pearl Barley) produced 3 generous portions. You could choose to use coconut milk or replace it with skimmed milk to make it a bit healthy. I used about 1tbsp of creamed coconut and about 150 ml milk. Heat a wide bottomed pan. Add Boiling water to it and add all the vegetables. 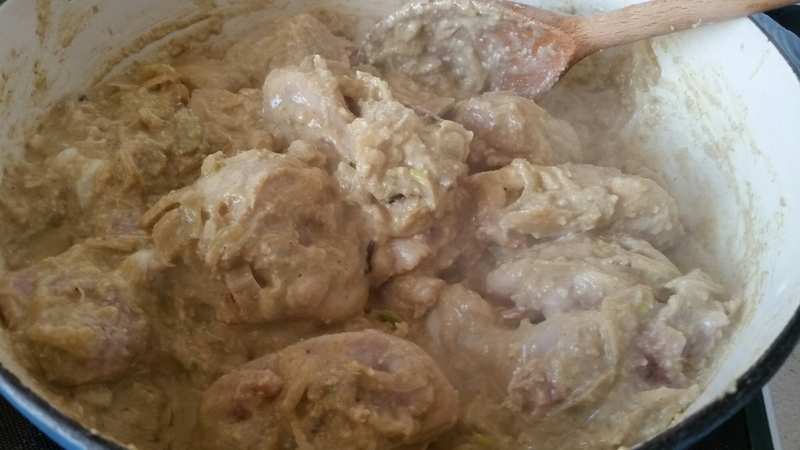 Add a heaped tablespoon of the green curry paste. Bring to a boil and simmer for about 15 minutes. Make sure that the vegetables are tenter. If not then boil for a bit longer. Add the coconut milk (or cream or normal milk) and simmer for a further 10 minutes. How blend (not too smooth) using hand blender. Season with Salt and Pepper. Add a tiny squeeze of lemon juice (optional) and serve with crusty bread or on its own. 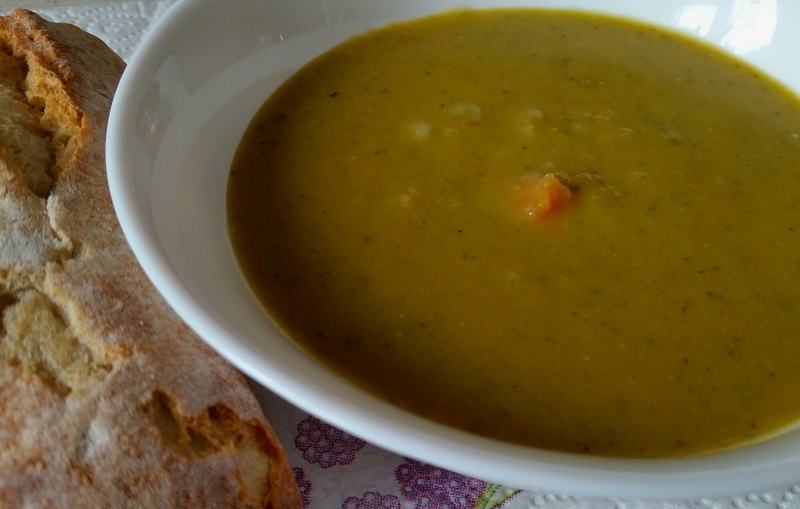 It was a quick and tasty soup that was ready in no time. Biriyani is one of my most favourite dish. Its a dish made of layers of Rice and normally meat or Chicken flavoured with spices. The origin of this dish is said to be from Persia but after centuries of refinement this dish is now widely available across the Indian Subcontinent. 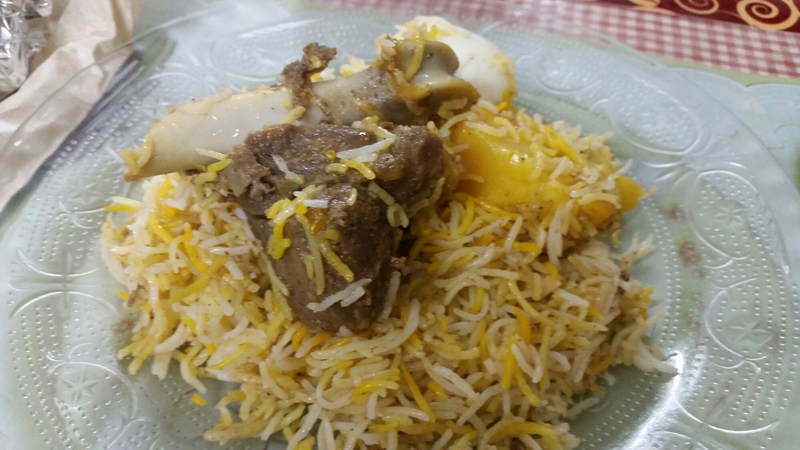 Different regions cooks it differently, for example the Biriyani from Hyderabad region is cooked with the rice and raw meat together from scratch while most other parts cooks the meat separately and then mixes it with rice. 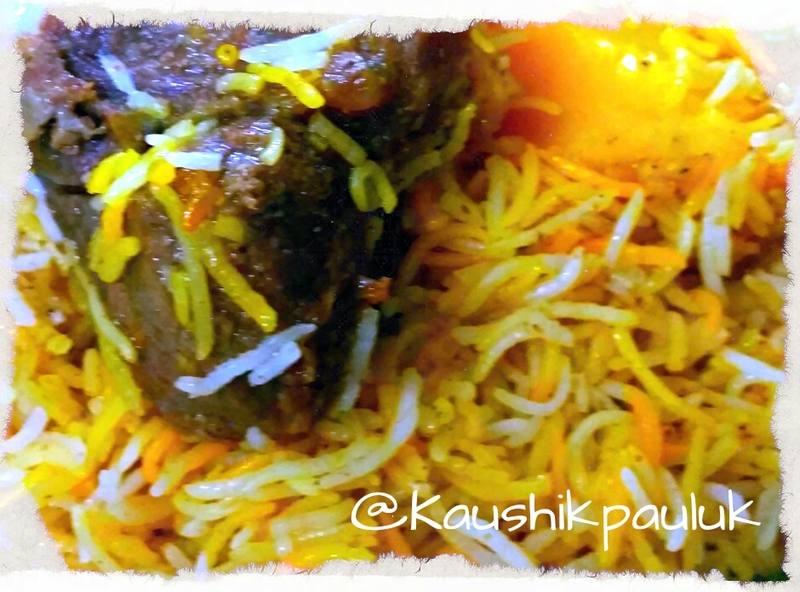 Mumbai or Bombay Biriyani is very spice heavy while Kolkata ones are much lighter. Kerela specializes in Seafood Biriyani and so on. For me having grown up in Kolkata, I am partial to the Biriyani from there and love the sweet soft potato in it. Kolkata loves it’s Biriyani. Legend has it that the Kolkata biryani evolved from the Lucknow style, when Awadh’s last Nawab Wajid Ali Shah was exiled in 1856 in Calcutta. His chefs replaced some of the meat and added the potato to keep the cost of this royal dish down. 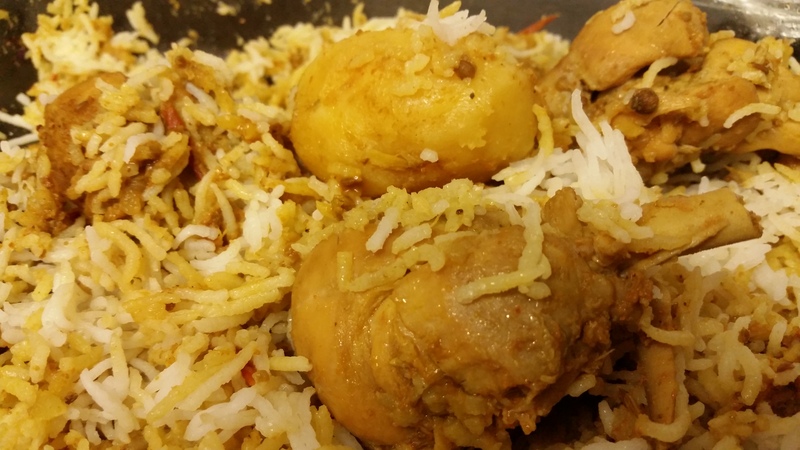 The Calcutta Biriyani is much lighter on spices. It primarily uses nutmeg, cinnamon, mace along with cloves and cardamom in the yoghurt based marinade for the meat which is cooked separately from rice giving it a distinct flavour as compared to other styles of Biryani. A true Kolkata foodie will argue about the best Biriyani in town and many restaurants have had decades of reign on the top. Royal with its Kashmiri origin reigned supreme around the late 70’s and early 80’s. Then it was the turn of Amenia in the new market area. Currently Arsalan in the Park Circus Area is one of the most popular. Others such as Shiraz Golden Restaurant, Zeeshan, Amber and even Nizam’s (inventor of the Kathi roll ) etc are popular too. The current trend is that the big guns which were all standalone establishments are now expanding into other parts of the city and other parts of India and even beyond. (Shiraz has a branch in Dubai). It would be lovely to have one in UK. During my recent short trip to Kolkata, I was fortunate to have tried the Mutton Biriyani from Arsalan and Amenia’s Chicken Biriyani. I have to say Arsalan’s Biriyani had a far superior depth of flavour and I really enjoyed it while Amenia’s Biriyani (my Mom’s favourite is of a more delicate and fragrant variety). 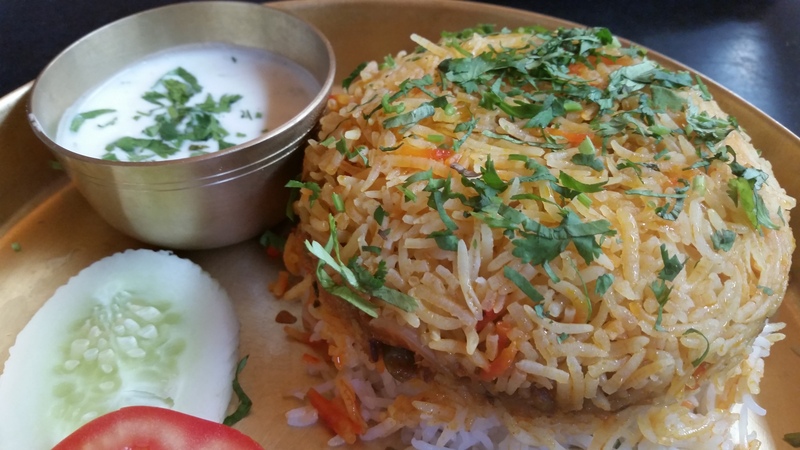 During the same trip I also visited Mumbai where I tried the Veg Biriyani at the Prithvi Theatre Cafe. Biriyani is a rich and complex dish that is very difficult to replicate at home and in my opinion is best left to the experts. At home I have made many attempts to recreate as much of the flavours without most the guilt associated with this Calorie laden dish. There are good quality ready made Spice Mixtures available widely in Asian Supermarkets that produces good results. I will put up a recipe in another blog post.